Detroit Mayor Mike Duggan with community and business partners of Motor City Makeover. Judging by the snow flurries and wind chill outside, you probably could not tell that it is spring in Detroit. Still, the city is going ahead with its spring cleaning plans, with the launch of Motor City Makeover 2018. The annual citywide cleanup and beautification effort is scheduled for May 5, 12, and 19. 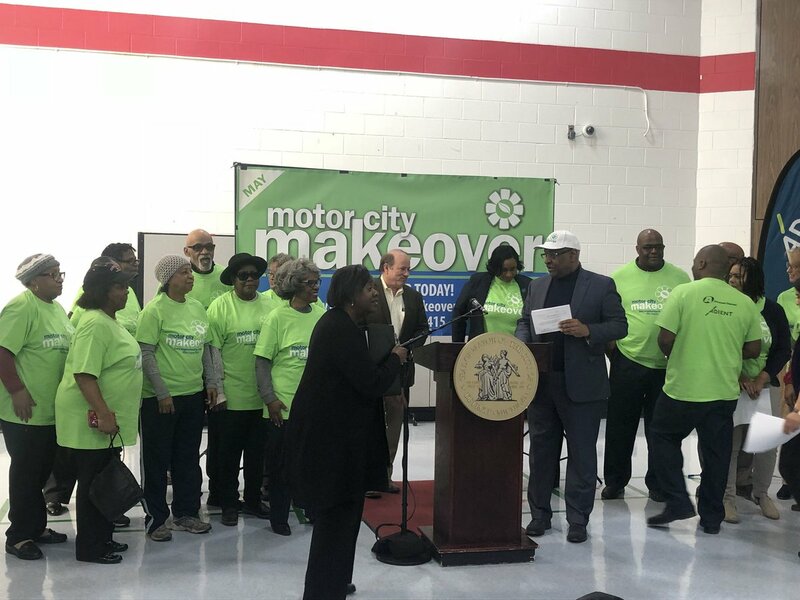 Mayor Mike Duggan and community and business partners kicked off Motor City Makeover at the Butzel Family Center, calling on residents, community organizations, business owners, and students to join the effort to clean and beautify the city. He also outlined plans for a small pilot program to clean a small number of alleys. This year, Motor City Makeover will take place in Districts 1 and 2 on May 5; in Districts 3, 4, and 5 on May 12; and in Districts 6 and 7 on May 19. Volunteers can register online at www.motorcitymakeover.org or call 313-224-4415 to join the effort or for more information. This year’s campaign has already raised $45,000 in cash donations and $15,000 worth of in-kind donations from area companies. The top two sponsors this year are Adient and Advanced Disposal. Other sponsors include Bell Equipment, Comcast, DTE Energy, Illitch Holdings, and Meijer. Any organization or company that would like to donate to Motor City Makeover should call 313-224-3400.